Running – Time To Kick It Up A Notch! After the half marathon last month, Alicia and I had a chat about our next one – the Royal Victoria in October. Alicia really wants to train to improve our time on the race (as opposed to our usual “we are happy to just finish the race”). At first, I was torn. On the one hand, running is my de-stressing time – I get out on the road, either with my tunes or my running buddy, and just enjoy the movement and the scenery, pounding out my stress with each step. So part of me thinks, “I don’t want to be constantly checking my watch for my pace, stressing myself out over how long I’m taking.” But on the other hand, one of the main reasons I sign up for these races is to scare motivate myself into doing the training (otherwise, I’m just too lazy and don’t do any exercise). But since I’ve now done four half marathons and know that I can get away with just doing the long runs and skipping most of the short runs and I’ll still be able to finish the race, just planning “to finish” isn’t meeting my self-scaring-motivating needs. So I agreed that picking a goal time and training for that time would be the way to go. Now, the training plan we’ve be using (i.e., the one “to finish” a half marathon) is from the Running Room’s Book on Running, but the next option in the book is “to finish in 2 hrs.” Which seemed to me to be a pretty big jump given that we’ve been running ~2 hr 23 mins half marathons. But I agreed to give it a whirl. So first I needed an iPhone app that would track my pace for me, because I knew that if I had to plan out a route where I knew where all the km marks were AND check the timer on my watch AND then calculate my pace from that while I was running, my head would explode. I had been using the iMapMyRun app, but it puts the pace in a teeny tiny font that I’d never be able to read while running. But Dr. Dan told me about an app he uses called “RunKeeper,” so I checked that out and lo, it did show me my pace in all its large fonted glory! With that, I was all set to try out a timed run! Yeah, totally not able to run a 5:55. And was totally miserable the whole time, knowing that I couldn’t run any faster and I wasn’t fast enough. After that run, I decided it was time to get more realistic. I looked for a training plan that would give me a finish time of ~2:15. I couldn’t find one exactly, but did find that if you go on the Runner’s World website you can use their “Smart Coach” online tool, where you put in things like your height and weight and last race time and how hard you want to train and it will put something together for you. The plan I got from there is a bit different than the Running Room one, but I sort of extrapolated from it that I should be running my short runs at around a pace of 6:30 and my long runs at about a pace of 7:30. So I’ve been doing that this week and guess what? I can actually do that! It’s a challenge, but it’s doable. 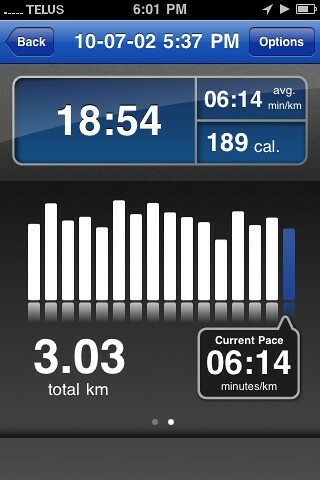 And now I’m back to not hating my runs again, so I’d say that’s a victory! Anyway, all of that was sort of a preamble to what I actually meant to blog about today – but now I’ve gone on and on and on and probably no one is even reading this posting anymore. And it’s late and I’m tired. So I’ll blog that other thing tomorrow! 2 Responses to Running – Time To Kick It Up A Notch! Wouldn’t kicking it up to the next level be runningsurviving a full marathon? Yes, that would be kicking it up to the next level. That’s why I’m just kicking it up a *notch*. I can’t even fit in all the training for a half marathon – I have *no idea* how people find the time to train for full marathons.